I’m Rebecca Overson, and I am on a mission to help massage therapists SUCCEED in business for themselves. As an LMT since 1995 (before the INTERNET, you guys), I’ve had plenty of failures and successes. I offer an 8 -week, high-level Mentoring Program for massage therapists who are serious about success. I’ve coached massage therapists around the world to reach unprecedented levels of success in their practices! Want to connect and get my advice for free? Join my free practice building facebook group: The Art of Building a Successful Massage Practice. See you there! 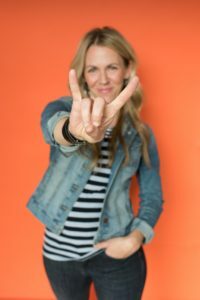 Rock Your Massage Practice Academy is my 8 week, online, life-changing, massage business mentoring program for creating a THRIVING private practice that you LOVE…without wasting time and money trying to figure it out all alone! You MUST also have financial resources to invest in starting or growing your practice before you apply for the program. Listen, working with me is not cheap, but the mistakes you are making are costing you literally thousands of dollars every year in lost revenue and wasted money. Be clear – my program is NOT a do-it-yourself massage business course that fills you with information but then leaves you wondering HOW to implement it. This is a very high-level GROUP MENTORING program where you will work with me to help you solve all your current practice building headaches in just 8 weeks. I have a few spots open each week to talk with YOU! I feel very fortunate that I was set up well by the massage school I graduated from in that I felt very ready to start my practice right out the gate. I was prepared to hustle, I was prepared to make connections, I was prepared to do laundry out the nose. For the first few months in business, I saw steady growth, I celebrated each new client, I talked to everyone I could about my practice. After a few months, I had a steady stream of repeat business but I felt I had tapped my network for new connections. I decided to work with Rebecca because I was in the do-or-die phase of my financial situation. 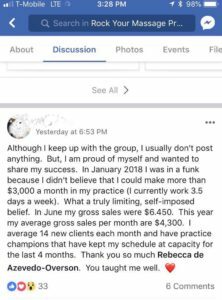 Through the program and working with Rebecca, I gained clarity on how to attract new people, people outside my network. I narrowed my focus to a target demographic and marketed my pants off to only those people. I made genuine, lasting connections with people who happily throw clients at me. I learned to be a marketing superstar. When I found Rebecca, , I was at my wits end. 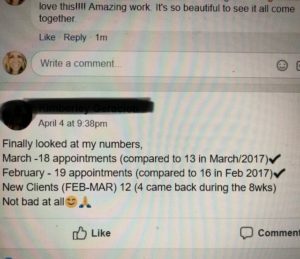 I had been working out of my home for 2 years, luckily starting with my client list that came from my old job (that gave me 4 days notice that they where closing!). But I hadn’t done much more then let them know where I was moving to and my hours. I had a fair amount follow me, but I wasn’t doing any thing to get new clients in. and as time goes people start coming less, though life changes and moving and what not. I had just had a 6 appointment month, and this was suppose to be my full time job. I was listening to some online business seminars and had not been very impressed by the presenters so far. I heard a lot of buzz words, and nothing that I felt I could take away and use. Then Rebecca de Azevedo Overson came on and just in hearing her story of starting out I could hear someone talking to me! in the same sort of situation I found myself in. and When she talked it wasn’t buzz words, it was useful interesting and actionable. She wanted to help. As soon as she said she would do a discovery call I was putting in my info because I wanted to work with some one that “got” me! I want to thank you for this intensive 8 week course. It has allowed me to focus differently on not only my business and it’s ebb and flow, but to look at life a little differently also. 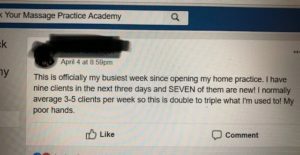 Since enrolling in the Academy I have seen an increase in business, and for this I am very grateful – Before entering this class, I hadn’t seen new foot traffic in over 4 months. In May I saw 5 new clients, and in June I have had 4 so far. I also have a new one coming in on the 2nd of July; this is an encouraging boost. The biggest measurable WOW factor for me was the number of new clients I was able to get in a short time period. One of my three goals during the mentorship was to get 15 new clients (I work part-time from home). I got FIFTY! In two months! And dozens more since! What I got from the mentorship that I was so desperately in need of was STRATEGY. Everyone knows you can offer discounts or create facebook ads or print flyers to promote your business. All of that is useless without a clearly defined strategy. I learned how to talk about my private practice in a way that appeals to the right people – how to market myself appropriately so my target clients are drawn to me. I narrowed down who my ideal clients are, where to find them, how to speak to them, and how to get them to refer their friends and colleagues to me. I was encouraged to create clear boundaries and to stand up for myself when required. 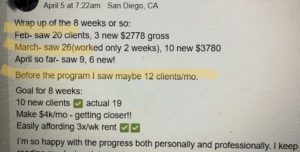 I learned to say no when I need to, and that I don’t have to fear my clients leaving because I’m raising my rates or I have limited availability. I learned to change my attitude when business is slow or I’m having a rough day. A simple shift in mindset can help immensely. I now see empty timeslots as opportunities to continue to promote my small business. Hell, I’m still learning! Hey there! My name is Rebecca de Azevedo Overson. 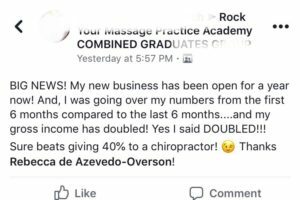 I started my massage career in 1995 at the ripe age of 18, proceeded to struggle for 8 years to make a living, and finally quit because I needed steady income. Massage wasn’t cutting it. I ended up spending the next 5+ years in business administration and learned a LOT about sales, marketing, operations, graphic design, HR, and more. I then left that career to be a mom and start my new work-from-home relationship coaching practice, while my husband supported us. 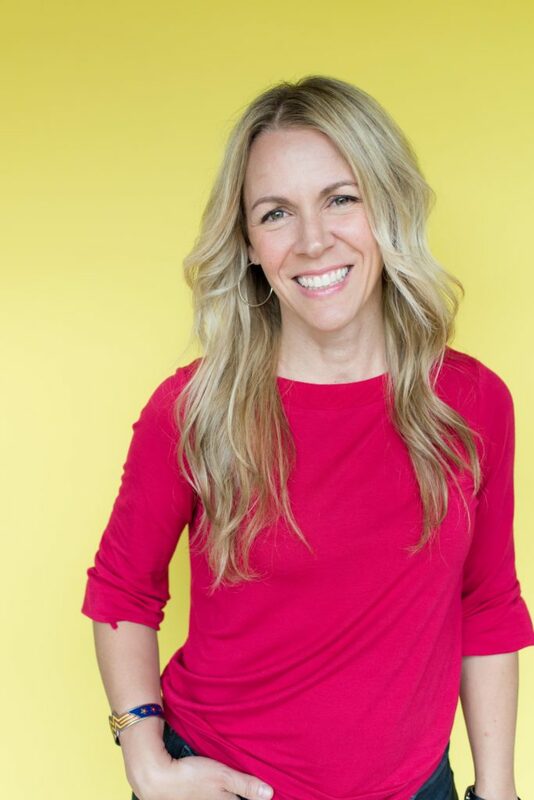 Then, as a young mom with two babies under 2, and a slow-growing coaching practice, my family suddently became desperate for income when my then-husband’s real estate business evaporated in the recession of 2008. I went back to massage, this time with a plan, strategy, business skills, and big mission to help make life easier for pregnant women. 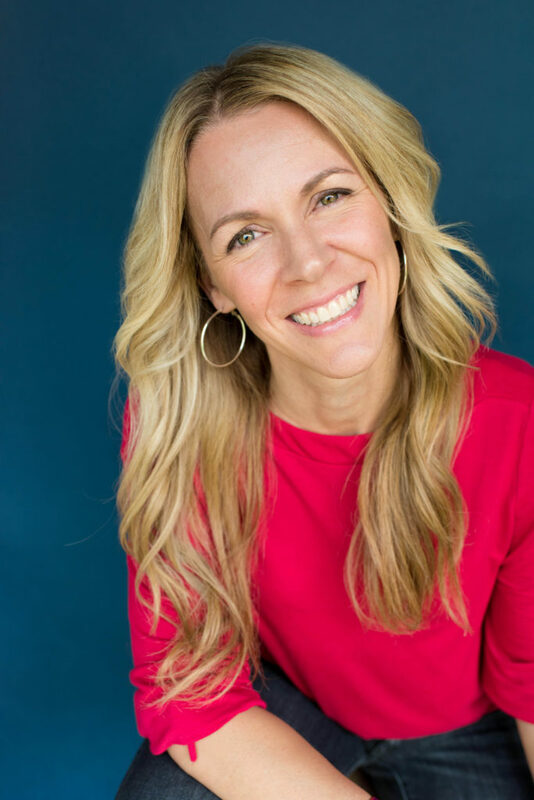 Inspired by my very empowering birth experiences, I created a successful prenatal massage practice almost overnight, which quickly grew into a multi-therapist clinic in Salt Lake City, Utah. In addition to being sought out for prenatal and postpartum massage, I became a Birth Doula, and a Fertility Massage Specialist. My staff and I served over 10,000 women ,offering massage, yoga, birth doula services, childbirth education, and more. It was a dream come true. I made it happen! I did it! 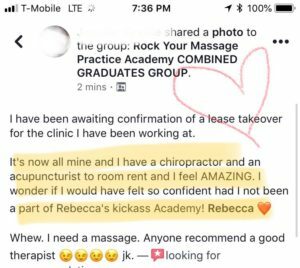 Then…knowing something else was “next” for me, I sold my practice, Salt Lake Prenatal Massage, in March 2018. 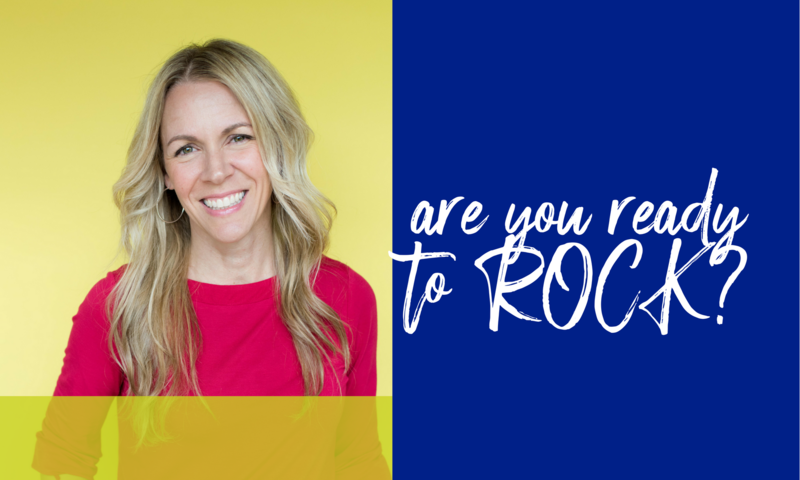 I understand firsthand the challenges that massage therapists face when it comes to building a successful business of their own, and I now help others through my 8-week “Rock Your Massage Practice Academy” – a mentoring program to help therapists build a thriving practice of their own. Join my lively and productive Facebook Group: “The Art of Building a Successful Massage Practice”. Want to hang out with me every week online? To empower massage therapists to build successful private practices, enabling them to do what they LOVE, make a DIFFERENCE, and make a LIVING.